Most of the talk around the office today, as well as on the news and throughout social media, was focused on two events: Thanksgiving, and the impending snow storm here in the East. For the past two days, we’ve had downright balmy temperatures. Quite literally overnight that all changes and we are due to have our first snow storm of the season, with predictions of anywhere between 6 – 10 inches of snow falling by Thanksgiving morning. The combination of the holiday and the weather seemed to create two issues of urgent concern on everyone’s mind: travel and food shopping. The issue of travel is of course a biggie, since people’s safety is at stake. As this is one of the largest travel times of the entire year, having thousands of folks out on the road during a storm is less than ideal. So in a flurry of scurrying and re-planning, I’m assuming many families have made some adjustments to leave either earlier or later than originally intended. We had already planned to travel Tuesday evening, and of course ended up having plenty of company. The other urgent matter, food shopping, is what I find more fascinating, and in some cases, frightening. This holiday is one in which a primary focus is food preparation and eating. Therefore in the days leading up to the holiday, the grocery stores are full of people shopping for turkeys, potatoes, pie filling and more. I ventured into my local store on Sunday and it was buzzing with activity. The aisles were crowded with each of us trying to navigate full carts around each other and displays. Some shoppers were polite and pleasant, while others exhibited a scowl on their face and steely determination in their eyes. Yet as busy as it was, there was no feeling of panic or urgency beyond the usual “get me the heck out of here” atmosphere…. Because at this point we had not heard about The Storm. Twenty-four hours later, the predictions were rolling in…. terms like “plowable event”, “potentially hazardous road conditions” and “inches per hour” came back into our vocabulary after being pleasantly suppressed since spring. And the need to get to the grocery store became paramount. 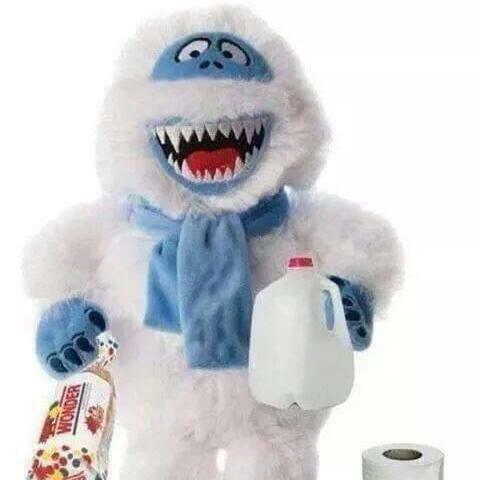 Now we weren’t just shopping for turkey, we had to get extra milk and bread!! One of my real women co-workers had to unfortunately venture forth during lunchtime today to get the side items she was assigned for her family gathering on Thursday. She survived the excursion, but reported it was not pleasant. Parking was a challenge, and the store was packed with people. She said it was a combination of angry and stressed-looking shoppers rushing through the aisles narrowly running over others with their carts, and somewhat bewildered seniors who usually have the place to themselves for their regular mid-day outings and social time. As a true seasoned real woman shopper, she dodged her way through the throngs, grabbed what she needed, eye-balled the cashiers to find the young man who was notoriously speedy, and escaped relatively unscathed. Of course this time we have the double whammy with the holiday, and many of us are hosting loved ones who will expect to eat more than peanut butter and jelly, regardless of some nasty weather. Those who planned ahead and purchased their Thanksgiving dinner ingredients a few days ago are all set. Really. No need to go back out and storm shop. Trust me, you’ve got enough food to get through it. Those who didn’t plan ahead, well, you just might have to get creative. In our modern day world, it is rare that we would be completely snowed in for more than 24 hours. Exceptions to this rule do exist, as we saw most recently with those poor souls in Buffalo. And yes, we all have stories of one or two Nor-easters that had us blocked in and without power for a few days. But for the most part, for your average run-of-the-mill snow storm, we likely all have enough provisions in our homes to survive a day until we are plowed or dug out. So why, I ask, do we still have that overwhelming desire to get out and stock up as soon as we hear the forecast? And why is it usually the milk and bread that gets cleaned off the shelves first? Surely we could survive by consuming other things. Personally, if I were to be snowed in, I’d want to make sure I have a hefty supply of chocolate, pasta, and adult beverages. We are just at the very beginning of winter. There will no doubt be several more forecasts that come to us with predictions of snow, ice, and yuck. Perhaps with this first storm, we can all work to get our milk-and-bread-food-panic out of our system and plan to be realistically prepared for the months ahead. For example, without getting worked up, I can take comfort in knowing that right now in my house I have oreos, m&m’s, spaghetti, sauce, and Baileys. I even have a few veggies in the freezer to be healthy. Snow? Bring it on. This entry was posted in Food, Holidays, home, Seasons, shopping and tagged family, groceries, preparation, snow storm, Thanksgiving, weather, winter. Bookmark the permalink.